One of the most unusual things to come out of the Vietnam war experience were Party Suits. Created and worn by air crew at squadron functions and other festive occasions, party suits were a local and unofficial creation that arose in 1967 from the 357th Tactical Fighter Squadron of the 355th Tactical Fighter Wing, stationed at Tahkli Royal Thai Air Base. They created "special flight suits" in response to the 8th Tactical Fighter Wings' usage of black dyed cotton flight suits for social occasions. 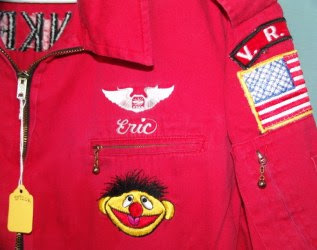 These flight suits were created with great imagination and creativity by the squadron members and were a staple of squadron life. 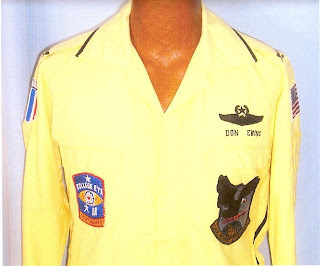 The use of these colorful, lightweight suits, popularly known as "Party Suits," was soon adopted by the Air Force flying units stationed at the large bases in Thailand. The tradition also quickly spread to units in South Vietnam and to a limited degree, other locations in Southeast Asia. Party suit usage was normally limited to flight personnel and those in direct support of flight operations. Party suit colors were consistent within the unit and generally had some standard form of name, rank and unit identification. Additional insignia, unofficial patches (usually humorous) and other embroidery was purely up to the creativity of the individual. 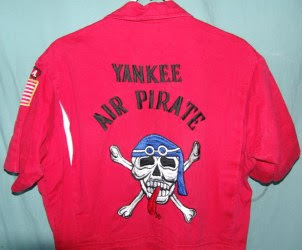 There were numerous local tailors near the air bases who specialized in making party suits and embroidering the many associated custom patches. The light and comfortable suits were ideal in the tropical environment and were worn on-base only for special social occasions in lieu of official dress uniforms, which were not commonly used in Southeast Asia. The most significant social occasion was the famous "Sawadee" party. Named for the Thai language greeting appropriate for both "hello" and "good-bye," this party welcomed newly arrived personnel and bid good-bye to those returning home. 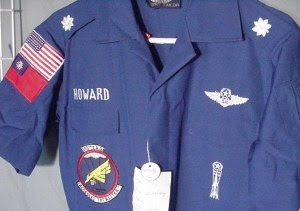 The party suit tradition, although superficially humorous, served an important role in Air Force organizations by promoting unit integrity. The tradition still is carried on today. USAF squadrons deployed to the Persian Gulf, Afganistan, and Iraq still have "party suits" for squadron occasions. The Cold War Air Museum salutes all those who served and sacrificed for their countries so that we may enjoy what we have today. 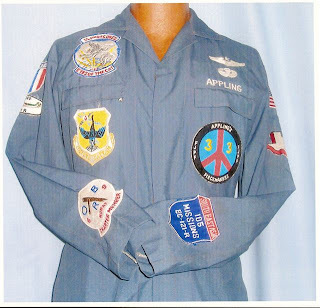 Former members of The United States Air Force 553rd Reconnaissance Wing, Korat Royal Thai Air Force Base (Batcat) contributed these pictures of their Party Suits. The unit had several unique and spiffy styles for every occasion. OK, guys, show us your party suits!